Murphy beds by FlyingBeds add value to your home by maximizing space & giving the room a dual purpose. 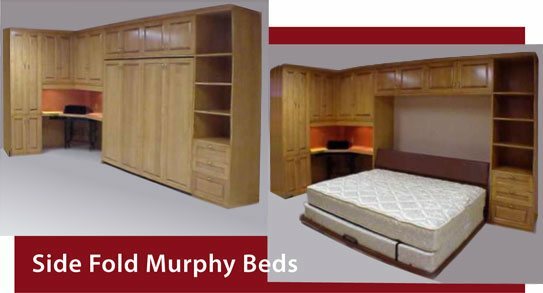 KING SIZE BEDS – Check out some of the myriad King size Murphy bed systems we have built over the years. To our knowledge, no other manufacturer can safely lift the weight of a King mattress. We are 100% Custom and can build the bed of your dreams. TV BEDS – Already have a comfortable sofa you love but want to add a guest bed to the room? A wall bed with TV is the ultimate in deceptive, yet functional design. Your guests will never know that a thick comfy mattress is hidden in the entertainment center until you pull down the bed for them. This 70″ is in a California King Murphy bed. TABLE BEDS – Increasing the flexibility and functionality of a multi-purpose room is simple when you add a drop-down table to a wall bed. Whether on the bed face or on a pier cabinet, a Murphy Bed with Table gives you that extra work space whenever you need it. When you’re done, it stores neatly away, elegantly disguised as a frame for your choice of art. MIRRORED BEDS – Popular for exercise rooms, all of our Murphy Beds with Mirror use a 1/4” thick real glass mirror, which is applied to the bed face using a special adhesive that will not corrode the silver backing. Only the SICO Room Maker mechanisms have the capacity to allow one hand lift and lowering of such massive weight. HOTEL BEDS – Some of our most prestigious hospitality projects include a Renaissance hotel, a Marriott hotel, and the Guest House at Graceland. — We ask the hotel, “What mattress and foundation do you want us to make disappear?” No limit on thickness or weight! “Does your design team have a theme suggestion?” No constraints. We are hospitality wall bed furniture experts. Trained installation crew option. SOFA BEDS – Sofa Murphy Beds are the ultimate way to make a room dual purpose. Turn a sitting or living room into a guest room by simply removing the cushions and lowering the wall bed. You choose the sofa design and materials. Your choice of mattress assures sleeping luxury. 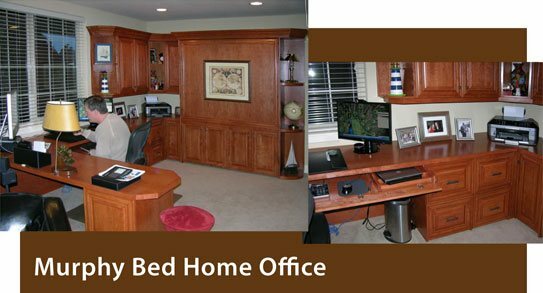 MURPHY BED HOME OFFICE – Do you put your guests on a futon in your home office room, or do you have a dedicated guest room that you’d like to turn into an office? 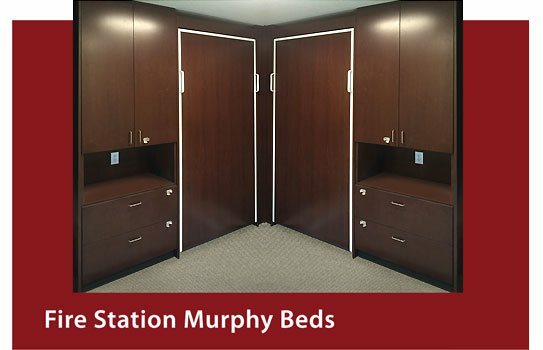 A custom Murphy bed system will give you the best of both worlds, and your guests will thank you for the comfortable sleep they get on a real mattress. SIDE FOLD BEDS – Perfect for limited-height or limited-extension rooms, where a traditional vertical bed is too long. 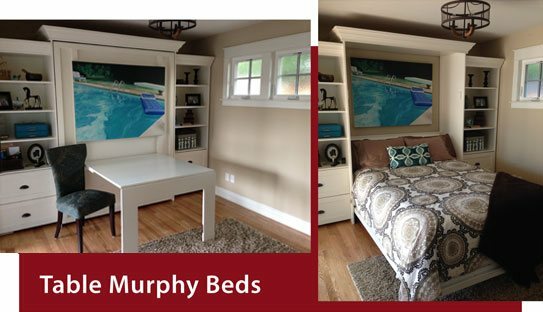 Any of our countless designs can be modified into a side-fold Murphy bed configuration to fit your room. RECLAIMED WOOD BED – Wyoming Snow Fence is the most popular of our Reclaimed Wood Murphy Beds. 7 years of sun and wind weather the wood to a beautiful gray, which we can tone to darker or lighter shades. Old nail and knotholes accentuate this wood’s rustic charm. Beetle Kill Pine Murphy beds are another beautiful choice. EXOTIC WOOD BED – While the majority of our woods are from the United States, we love to adventure into the tropics. Here is a Queen Murphy bed in a selection from Africa. We have worked with 46 species of tree so far. 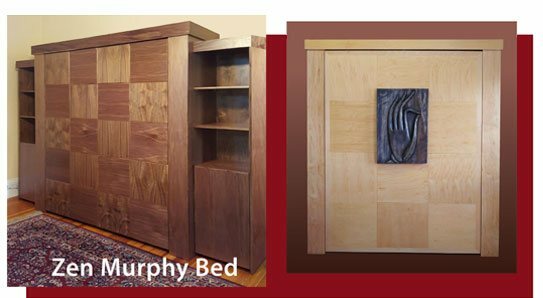 ZEN STYLE BED – The Zen style Murphy Bed features alternating patterns of wood blocks in a chess board theme. Your choice of wood and finish. Here is walnut and maple. To date we have manufactured this design in 8 woods and many finishes. A real bed hidden in design and functional change. GOTHIC BED – We manufacture this traditional English Armoire theme to fit the SICO Room Maker or the SICO Eurobed. This design usually requires a room having additional height. Endless design options. Shown here is a Gothic queen Murphy bed. 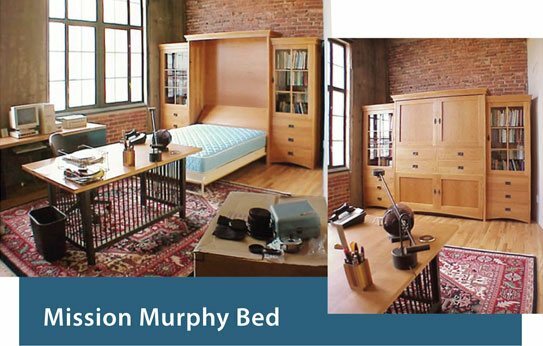 MISSION BEDS – Mission style Murphy Beds are manufactured to the standards of the Stickley Company, with reference to Gustav in the 1920s. With this as the base of design, we can customize any part of this wall bed system in material, finish, or function. Most popular is the configuration featuring non functioning upper and lower doors, and 4 faux drawers in the center of the bed face. 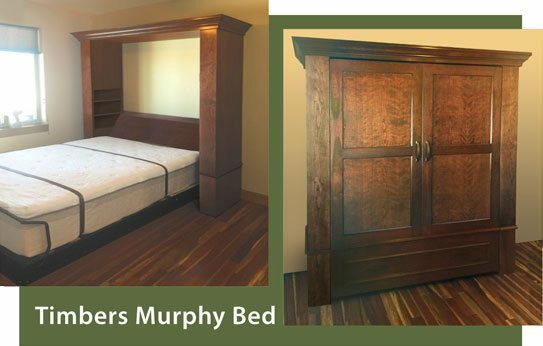 TIMBERS BED – A classic and endlessly customizable design, Timbers Murphy Beds is our most popular Queen Murphy bed system. Choose any wood and any finish, then add raised panels, carved or bun feet, fluting, rosettes, a base cove, or anything your heart desires, and you’ve got a truly one-of-a-kind personalized Flying Bed. 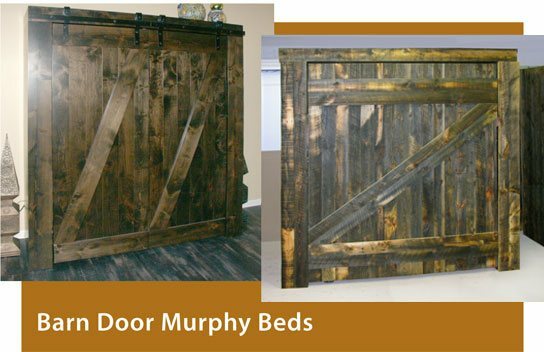 BARN DOOR BED – Whether you choose a look that is rugged and weathered, or sleek and refined, a Murphy bed disguised as a barn door adds the perfect touch of rustic charm to your home, and of course, a comfortable bed for your guests. FIRE STATION BEDS – This fire station in Colorado has 3 SICO Twin XL beds in each Sleeping Room. The room was 12’ x 12’. Very comfortable for the fireman on duty, because it was ‘his private room and private bed’. Aside from the three Murphy beds and deluxe lockers, each room had a work desk. Ask us for a floorplan. A Murphy bed from FlyingBeds is a worthwhile investment that will transform and maximize any space in your home. 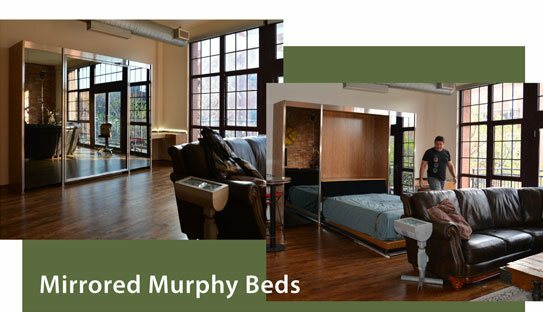 We have over 35 years of experience when it comes to manufacturing the highest quality, luxury Murphy beds for residential and commercial use. We specialize in making rooms become more valuable by giving them a dual purpose. When you receive a bed from FlyingBeds you will enjoy both its comfort and its design. A Murphy bed, also known as a wall bed, hides your mattress vertically against a wall to free up space in the room. You can choose a mattress of any size and any thickness and we will make it disappear into an entertainment center, an armoire, behind a mirror, a sofa, and more. At FlyingBeds, we are proud to provide a hidden wall bed for any space. 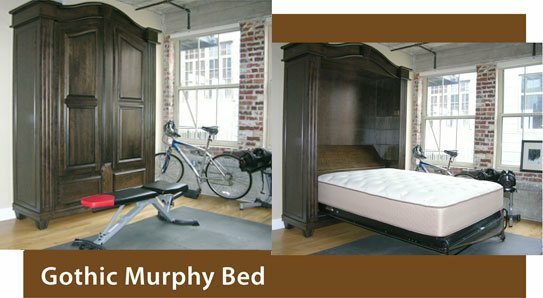 Murphy beds help to create a multi-functional room that can enhance the long-term value and functionality of any home. With a murphy bed, your guest room can easily transform into a workout room, a home office, an entertainment room and more. You do not have to be super strong or very tall to use your murphy bed. We ensure that the lift mechanisms are convenient and reliable. Additionally, Murphy Beds can be closed with bedding and pillows in place, which makes the entire process extremely easy. With a variety of styles, sizes, and finishes available, a wall bed makes your entire home more valuable. These days, mattress technology has evolved to a point where any individual can find a wall bed that is customized just for their unique needs. FlyingBeds has years of experience when it comes to providing all of our clients with custom Murphy Beds of superior craftsmanship. Murphy beds by FlyingBeds can be customized to any specifications: a king, a queen, any size, turned into a desk, a decorative wall, a shelf. FlyingBeds can attach to a wall or the floor, and we ship the necessary mounting hardware with the bed. FlyingBeds are packed in plywood crates and delivered through common freight carriers to your home. You will be provided with a tracking number. The bed is fully assembled before leaving the factory, and is shipped in 4 to 6 pieces for easy re-assembly. We offer installation all over the country, if within your budget. You can also hire a local handyman to assemble your new murphy bed. We are available by phone to provide guidance if needed. Because each bed is a custom creation, they cannot be returned. But of course, you are involved in the design process, and production does not begin until you approve the renderings, wood, and finish.